No word yet when Sharp will release their “Galapagos” Android tablets outside Japan, but over here, the 5.5- and 10.8-inch devices will drop into stores on December 10. Big S will start accepting pre-orders for the tablets, which were unveiled back in September, starting December 3. And they won’t be cheap. Japanese buyers will need to pay $476 for the smaller model and a whopping $714 for the bigger one (including an 8GB SD card). By way of comparison: prices for the iPad in Japan start at $580. 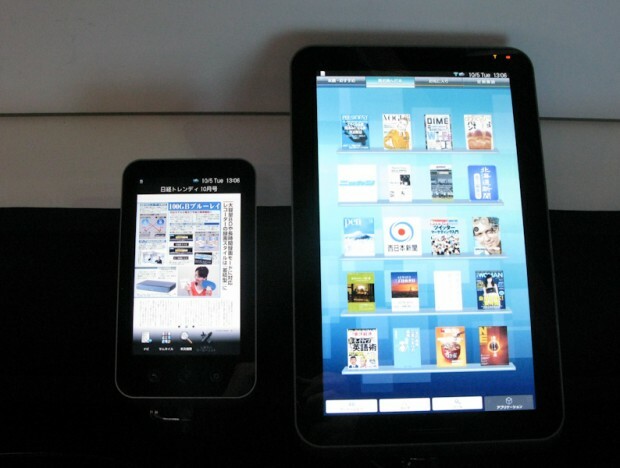 To recap, the 5.5-inch tablet has an LCD screen (1,024 × 600 resolution) that’s optimized for displaying paperback books and comes with a trackball to scroll through pages. The bigger device comes with an LCD screen (1,366 × 800 resolution) that’s optimized for magazine content formatted across a two-page spread. Sharp also confirmed the roll out of a contents platform tailor-made for Galapagos devices, which will boast a total of 30,000 newspapers, magazines, and books at time of launch. Here are the hands-on videos I took in October.